On the morning of April 5, 2017, Kelly Hurley was struck by a box truck while biking to work on First Avenue at Ninth Street. Hurley, who lived on the Lower East Side, died the following week from her injuries. She was 31. 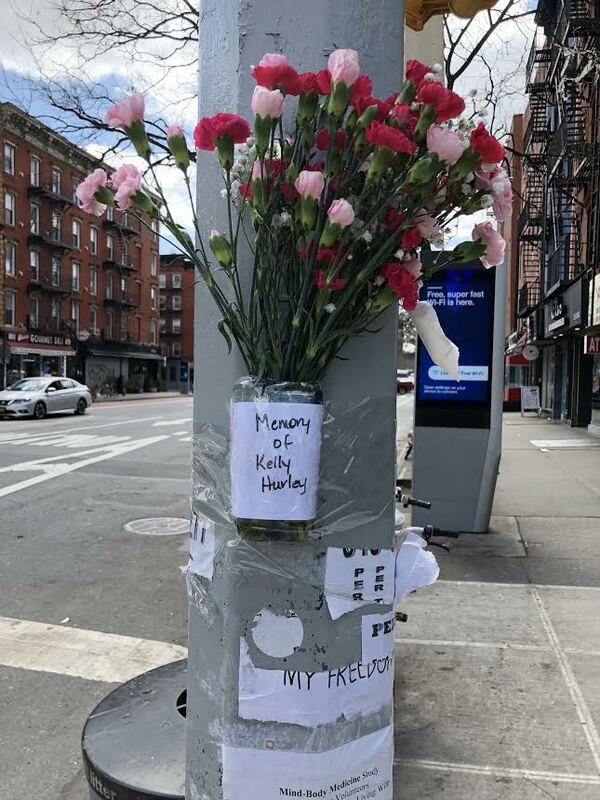 Flowers in her memory arrived today on the southwest corner of First Avenue and Ninth Street. Previous reports stated that he had come to a complete stop on First Avenue before making the abrupt left turn onto Ninth Street across four lanes of traffic. He struck Hurley, who had the right of way. Police gave Hyun a desk appearance ticket. 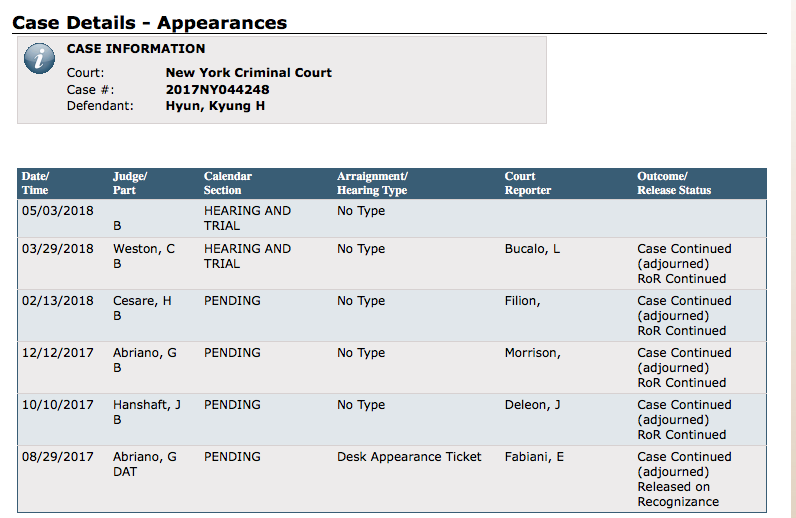 He first appeared in Manhattan criminal court on Aug. 29, the Daily News reported. 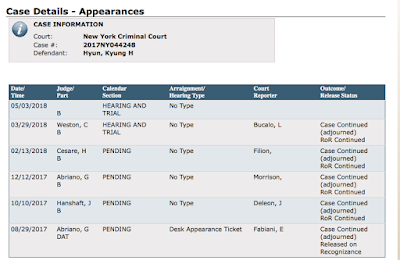 He's due back in New York Criminal Court on May 3. Streetsblog reported in February that that DOT is expected to release full results of its study of bicycle intersection designs sometime this spring. This is so scary. I bike up 1st all the time and think about this every time. I still really don't understand how this happened. Was it that the light turned and he basically decided to race in front of everyone else and she was there? I wish they described more about these so everyone could learn! You don't need to race at this hour (it happened before 8AM). You just put your truck in drive and go across the Avenue, not much traffic at this hour and you can see traffic coming at least as far as 6th St. Just like it happens EVERY DAY on 1st Avenue (either by truck, Taxi, Car Service or random guy from NJ). Since Traffic moving violations are not enforced no drivers feel they need to follow them. The driver who killed Kelly Hurley can have his case re-adjourned indefinitely and keep driving his truck every day. He drove it today and he will drive it tomorrow. If I want to get away with murder, all I do is kill my nemesis with a car in a bike lane? Although nothing is worse than death, especially one that could have been avoided if not because of a selfish prick driver, but seeing that posted link where the NYPD determined that she slipped is abominable. or care, if he saw her, maybe he thought she'd stop, being he was a big truck and all. when the light changed (assumption the light changed ) and didn't see him coming till it was too late. He took her life away, the whole year he had, she, her family and friends did not. Just curious, does anyone know if she had a helmet on? She 100% was wearing her helmet and always biked safely and according to the law. A police officer she was friendly with in the neighborhood where she worked recounted a story of her walking her bike home one day when she forgot her helmet. Her friends and family miss her terribly.